We now have several libraries who have installed LibraryThing for Libraries enhancements in their discovery layers! 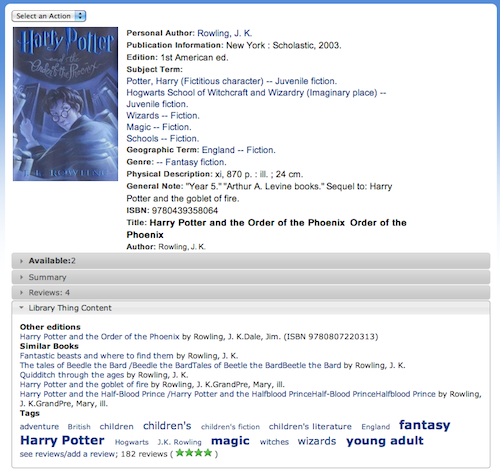 Check out Mount Laurel Library, with Reviews and Catalog Enhancements (Tags, Similar Books, and Other Editions) in their Enterprise catalog—See Harry Potter and the Order of the Phoneix. 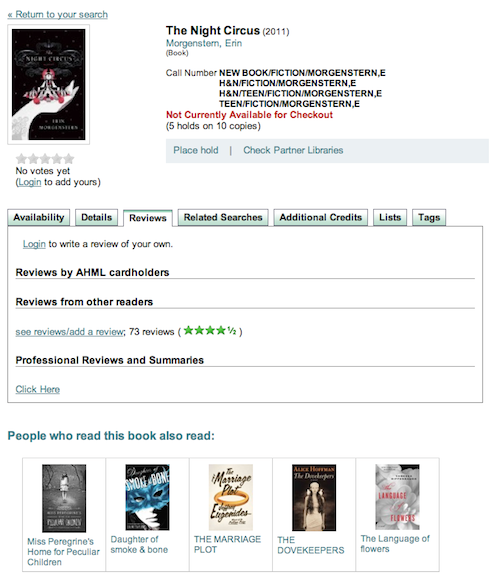 Arlington Heights Memorial Library has enabled Similar books, Reviews, and Lexile measures in their SOPAC catalog—See the record for The Night Circus. 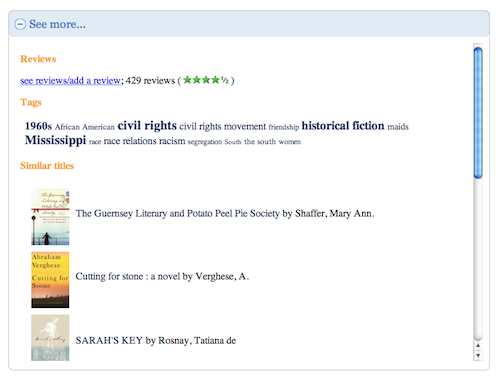 Nelson Public Library in New Zealand has our Reviews and Catalog Enhancements (Tags, Similar Books, and Other Editions) working in EBSCOhost Discovery Service—See the record for The help. As we announced last summer, LibraryThing for Libraries also integrates with VuFind! Email me (abby@librarything.com) with questions about any of the LibraryThing for Libraries OPAC enhancements, or our mobile product, Library Anywhere! To subscribe, contact Peder Christensen at Bowker—toll-free at 877-340-2400 or email Peder.Christensen@bowker.com. We also do weekly webinars to show off both Library Anywhere and all the LibraryThing for Libraries enhancements for your library catalog (Tags, Similar books, Other editions, Series, Awards, Shelf Browse, Reviews, Stack Map, and Lexile measures)! Click here to register. On the Browse Meetings page, search for “LibraryThing” to see a listing of all upcoming webinars.